Unfortunately, many dogs will get fleas at some point. These quick little jumpers cause a lot of trouble in dogs, and in case of a severe infestation they can even bother humans. In contrast to what many people think, most flea problems occur at the end of summer and in autumn. In the UK, the cat flea is one of the most common, even in dogs. Fleas are small insects, and only the adult fleas are visible to the naked eye. Although they are only about 3 mm in size, their strong hind legs allow them to jump extremely far. The adult fleas look for a host to draw blood from. The females then lay eggs, around 20-45 per day. These eggs will end up in the dog's environment and make up about half of the total population. In the next development phase, larvae develop. These larvae shy away from light and hide in or under carpets, rugs, and in nooks and crannies. The larvae pupate and this stage can take a long time. In unfavourable circumstances, the flea will rest in this pupal stage. When there are vibrations, heat and/or an increased concentration of CO2, the larvae turn into adult fleas and look for a host for a blood meal. This typically causes problems when owners return from their holidays. All eggs and larvae have pupated during the holidays and await hungrily. At the point where you get back home, they strike en masse. A flea plague is born. 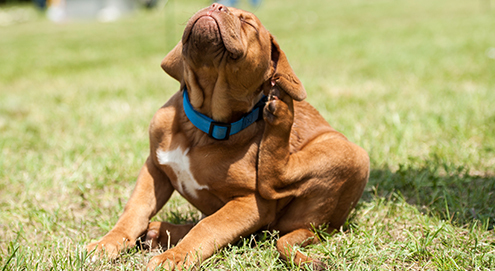 How do you know whether your dog has fleas? Fleas are not always easy to spot. They are extremely fast and they are good at hiding. The largest part of the total flea population, approximately 95%, will be in the dog's environment. Only about 5% will be on the animal at the point at which they want to feed. Adult fleas can sometimes be found using a flea comb. In the event of an infestation, it is more likely that flea faeces are found in the coat. This consists of small black dots that turn red when you put them on a piece of wet kitchen roll. This consists of partly digested blood from the host. The symptoms are fairly typical. Flea bites are very itchy. We often see dogs jump up suddenly, biting themselves fervently around their backsides. On the skin, you will see small red marks left by flea bites. There may also be bite marks cause by the dog itself, or even hotspots. Dogs with flea allergies are allergic to flea saliva and this will cause them a lot of discomfort, even some time after a bite. In addition, anaemia can also occur in the host following a mass infestation. Fleas can also transmit tapeworm eggs, causing a tapeworm infestation. There are all kinds of products available that can be used to prevent or treat a flea infestation, including sprays, spot-on pipettes, collars and tablets. Shampoo is only used when it has been established that there are fleas on the animal. In contrast to what is often claimed, there is not currently any concrete evidence to suggest any resistance to flea products. It is important to choose a product that is active in as many stages as possible, especially in the event of an infestation. It is also essential that you treat all dogs and cats in a household at the same time.. Unfortunately, no product is 100% effective. A failing approach can usually be attributed to insufficient treatment of the environment. As a large part of the infestation takes place in the animal's environment, it is crucially important that this is treated properly! This must be done by vacuuming thoroughly, washing beds and rugs at a high temperature and using a spray on the environment. Depending on the severity of the infestation, it may take longer to fully control a flea problem. Ticks are small arachnids with four different life stages: the egg, the larvae, the nymph and the adult tick. Only the latter three stages of female ticks feed on the blood of a host. This blood is necessary for hatching its eggs. When the tick has filled up on blood, it drops off its host and lays hundreds to thousands of eggs before dying. Adult ticks are only active in temperatures above 7 degrees Celsius. They are mainly found in tall grass and shrubbery. Ticks are notorious for transmitting various diseases. Ticks themselves do not cause diseases, but they can be contaminated with various types of bacteria and/or parasites. These nest in the tick's salivary glands. The most common tick in the UK is the Ixodes ricinus (castor bean tick), but the Rhipicephalus sanguineus (brown dog tick) and Dermacentor reticulatus are also found here. These ticks can transmit anaplasmosis or Lyme disease. Some ticks only occur in hot climates such as those of Southern and Eastern Europe. The diseases that they can transmit, including babesiosis and ehrlichiosis are therefore usually seen in dogs that have been abroad for a certain period of time. This condition is caused by the Borrelia burgdorferi bacteria, with the castor bean tick as a vector. A considerable proportion of the ticks in the UK are contaminated, resulting in regular cases of Lyme disease in humans. Unfortunately, this condition can cause serious problems in humans. Dogs can also be infected with the Borrelia bacteria, but in most cases they do not have any clinical symptoms. The bacteria is fairly easy to treat with antibiotics. There are vaccines available for the disease, but it is important to assess whether vaccination is desirable on a case by case basis. This condition is transmitted by a tick species that mainly occurs in warmer climates. The condition is quite common in dogs returning from Southern Europe. In addition, dogs can infect each other directly through blood contact in cases of transfusion or bite wounds. Babesia is a parasite that settles in red blood cells. When a tick feeds on the blood of an infected dog, the condition is spread further. An infected dog will show clinical symptoms within a few weeks or months, including fever, anaemia, red/brown urine and sometimes jaundice. This is often accompanied by general discomfort and reduced appetite. When caught early and treated quickly, an intensive treatment can lead to a full recovery. This condition is transmitted by the same tick that also transmits babesiosis. It is therefore possible that a dog is infected with both parasites. The Ehrlichia bacteria infects the white blood cells, and like babesiosis it can be spread via ticks, blood transfusions and bite wounds. The disease can be acute, chronic or subclinical. In the latter form, the dog will not show clinical symptoms. The symptoms may vary depending on whether the infection is acute or chronic, and this also affects the treatment and prognosis. In general, fever, loss of appetite, weight loss, increased bleeding tendencies and enlarged lymph nodes are the main symptoms that can be observed. The chronic form can also be accompanied by eye, kidney, muscle and nerve problems. As ticks can only transmit diseases after a certain time, it is important that you remove them as quickly as possible. If you remove a tick within 16 hours, the risk of it transmitting a disease is low. There are various tools available to remove ticks as easily as possible. It is important to try to remove the tick as a whole. In the past, alcohol was often used to disinfect the area. This must be avoided! This disinfection may cause the tick to empty its salivary glands faster, therefore transmitting diseases. In order to protect dogs from diseases that can be transmitted by ticks, tick prevention is crucial. Various products are available for tick prevention and control. Like flea products, unfortunately there is no single product that can prevent 100% of tick bites. That is why it is recommended that you regularly check your dog for ticks and remove any ticks that have attached themselves as quickly as possible using a tick twister. Tick prevention is possible by administering a tablet, a pipette (Spot-on) or by using a collar. Spot-on pipettes are administered onto the skin, and usually need to be used monthly. Collars, on the other hand, are active for several months, which make them easier to use. Fleas and ticks can cause a lot of disruption and lead to all kinds of health problems. Good prevention and fast action in the event of any problem is essential for your pet's health. There are various options for prevention. Depending on the situation, you may choose a spot-on product, a collar or a tablet. Dealing with a flea infestation requires some serious effort in treating the environment as well as the animal. Don't let it get that far! Spot on pyriprole flea and tick treatment. Imidacloprid spot on drops against fleas. Environmental spray to combat fleas and mites, with Dimeticone. Protects against ticks, mosquitoes and sandflies. To remove ticks completely, safely and easily.